A few weeks ago I conquered a challenge that a lot of Small to medium businesses don’t do. Backup my data. My friends at HP sent me an RDX unit with 2- 2TB drives to try out. The RDX unit is a external or internal USB 3.0 disk backup storage unit. The key is it can work in place of that tape system you might have or might still be using. 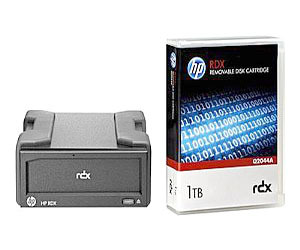 The RDX removable backup system works by inserting the disk cartridge into the device. You can then backup the way you want. If it’s a single computer, copy files or run an OS backup. If its a Enterprise server, schedule backups of the OS and files using the RDX software. It takes me back to one of my old IT jobs where everyday I had to go into the server room and switch out the tape backup. There were 10 tapes to this system – 7 tapes, labeled Monday, Tuesday, Wednesday, Thursday, Friday, Saturday and Sunday. This would give us 7 backup points if any problems occurred. I then had a monthly tape, a quarterly tape and a yearly tape to run as well. With the RDX system, it might not be that intense. Maybe one for weekly, one for monthly. But data is data. And it doesn’t matter if the business is a small one or large. I am a one-person shop. If I lose anything off my computers I could be set back or even devistated. Cloud backups are nice, but if a problem occurs, you want to restore as quick as possible. Even having to reload the operating system can take an hour or two out of my work day. That is why I backed up all my OSes on one disk. By the way, did you know you can tell a Mac to write to an NTFS drive? By typing in a couple lines in Terminal, you can identify a NTFS partition and allow it to write. You can also format an RDX disk as EXFat to switch between Mac and PC. RDX matches DOD encryption standards so you can set your data as safe as you need. This is a hard drive in an enclosure, so you could even run it as a regular hard drive. Best part – the RDX Disks are built for durability. How so? Well not only do these disks have a 5,000 load/unload insertion and 10 year archival lifespan, they also have a 97% survival rate if dropped. Just like this video shows. The cartridges are sealed, so they also are protected from dust and dirt. That’s perfect if you run a warehouse and keep your backups stored around that environment. The HP RDX unit connects via USB 3.0. The unit also requires a standard power adapter. You can choose external or internal unit – there is even solutions for rack mounting more than one. Disk cartridges come in multiple sizes up to 2 TB, which can store up to 4 TB of data compressed. Disk backup is important for anybody – from the person who needs to keep pictures and invoices secure, to the SMB or enterprise who runs daily backups.